Baking and Cooking, A Tale of Two Loves: Mediterranean Lamb Stuffed Peppers and Guest Blogger Jessics Hose@ Oh Cake! Mediterranean Lamb Stuffed Peppers and Guest Blogger Jessics Hose@ Oh Cake! Good Morning! While I am taking time off, due to my Father's health, I am having a couple of wonderful guest bloggers to take over my kitchen. I would like to introduce you to Jessica@Oh Cake!. I met Jessica when I joined the Love Blog Hop. She is also the brainchild of The Food Bloggers Network, which is a group where bloggers can focus on professional development and networking . I belong to this group, and have learned a lot. Besides being a talented writer, Jessica can also bake and cook. Jessica's Molten Lava Cake with Raspberry Lava and Lamb stuffed phyllo packets are just a few of her sweet and savory offerings. Now, Here is Jessica! Hello! I’m Jessica from Oh Cake! and I’m very pleased to be guest posting for Becky today. Becky has so many wonderful treats on her page (the Irish Cream brownies are one of my favorites!) that it is an honor to be asked to write a post for her blog. It was a struggle, however, to try to decide whether to bake or cook (Becky and I have that in common…) and so in the end I decided to do a savory baked dish: Mediterranean Lamb Stuffed Peppers. 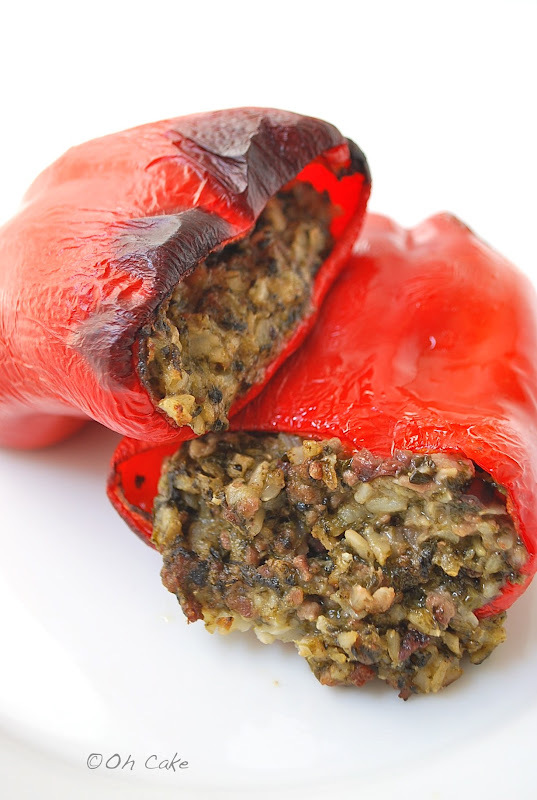 Stuffed peppers are a truly international dish. Whether they are stuffed with fresh cheese and batter fried as in Mexico, or stuffed with potatoes seasoned with tantalizing spices such as in India, you can be sure that wherever peppers are grown someone is stuffing them and serving them as a meal. For my version I like to take my inspiration from the Mediterranean, and Greece in particular, by using lamb, Kalamata olives and feta cheese. My husband Thom and I love lamb but unfortunately it’s rather expensive. By using ground lamb we get the full flavor of rich, savory lamb without the specialty butcher price tag. The filling for the peppers may be made a day or even two days ahead of time which will allow the flavors to marry and develop before baking and serving. Heat a large skillet over medium heat. Add olive oil and warm through. Add minced onion and sauté until translucent. Add lamb and begin to brown. Add spinach, oregano and garlic. Cook lamb thoroughly. Remove from heat and stir in cooked rice, olives and feta cheese. Combine well and adjust salt & pepper to taste. Set aside to prep peppers or store in refrigerator overnight. Take a paring knife and run it around the inside of the pepper to remove the core and seeds. Reserve tops of peppers but discard the seeds. Pack pepper three-quarters full of filling and set in a roasting pan. In order to keep the filling inside the pepper during cooking I crumple up a piece of aluminum foil and rest the pepper on it at an angle. This helps to keep the filling from falling out as the pepper softens during cooking. Bake 30-40 minutes or until peppers are soft. You may wish to gently rotate the peppers halfway through cooking to ensure even cooking on all sides. You can gently life the peppers with tongs to do this. I like to serve my peppers with a Greek inspired side salad. I finely chop the reserved pepper tops and combine with lettuce, cucumber, feta and olives to serve alongside the finished peppers. Add some baklava for dessert and you’ll really feel like you brought a little piece of Greece home with you! Enjoy! You can follow Jessica on Oh Cake!, Facebook or Pinterest! Great to see Jessica guest posting for you today! My thoughts and prayers are with you during this trying time, Becky. My husband does love lamb, but I do agree that it can be pricey. Glad to see that I can get a great lamb entree on the table without too much expense. Lots of tasty Mediterranean ingredients here-yum! Well done Jessica! Thank you so much for having me as a guest on your site, Becky. It's a pleasure to work with you! I am thinking of you and your family - don't hesitate to let me know if I can help in any way. Thank you for being a Guest blogger for me. Your peppers look great, and I'll have to make them for my hubby, who loves lamb. Beautiful peppers and I love the change in flavors. Been thinking of you Becky and so glad you are taking some time off. Will go say hi to Jessica. Keep me posted on how you are doing. Take all the time you need to spend time with your Daddy...every moment is precious! These peppers looks really good...Michael loves stuffed peppers, so maybe I should make these for him! Yum! The peppers sound good! Becky, I hope all goes well with you father, good luck! Off to Jessica's now.